To be guaranteed swag, please register by August 11th. Hard Deadline: Registration closes August 31st. *See race rules and regulations for more information. Spanish Peaks Striders Facebook page or call 303-746-3092. Other details. Featured in Trail Runner Magazine! Great job by the event organizers and volunteers! Flew in from Tampa with my wife to watch my daughter Erin, who drove from Kansas City to compete in her first Triathlon. Thanks to Raton Parks, police and fire and NM parks for supporting this. Our first time to Raton, nice area. Of all the races I’ve done, I think this was the most fun. The locals were welcoming, and everyone was helpful and cheerful. 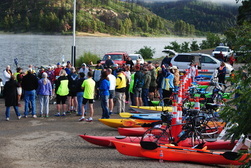 Multi-sport races take a huge number of volunteers, and the whole event was well organized. It was the perfect length, with good competition. I really enjoyed the setup of the course. The run, paddle and the bike were all in spectacular areas with great scenery. I had a blast. Fun atmosphere. Well organized.